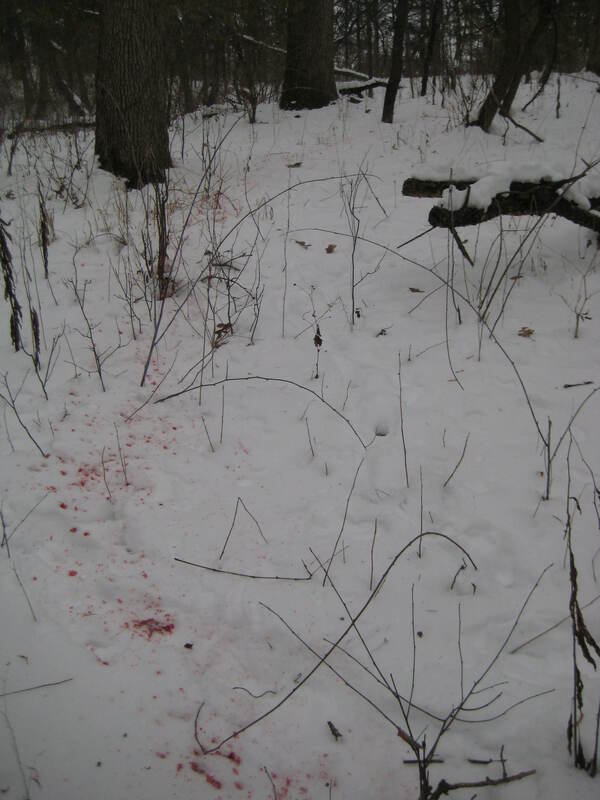 Catch up on the back story of the public land doe. Check out Public Land Lottery Win, Update on Public Land, and Scouting the Public Land. For those of you who have followed me since before the season began, you know that I was able to secure a permit for a piece of public land that opened up (for me) on November 14th. I didn’t know what the pressure had been like during the first portion of the season, so I gave it a couple of weeks to cool down before heading up there. To say that I was excited to finally hunt is a huge under statement. Not only that, I knew that on Friday December 16th, the wind was going to be as good as it could possibly be for me to sneak in and hunt it effectively. First off, I want to point out that I was purposely heading in to take a public land doe. That is a major objective of the program that I’m participating in. With a freezing cold SSE wind that was blowing steady at 12-15 MPH, I had the perfect entry route to the break in the fence. I figured I could sneak in there and check the tracks. See how often the break is really being used. As I slowly walked in the low lying ditches to where I wanted to sit. As soon as I crossed a fence that runs through the property, I saw a white tail go up. A doe took off into the wind away from me. 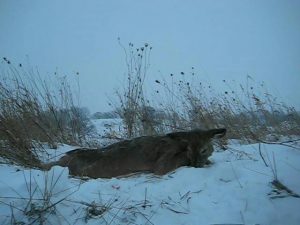 As soon as I saw the doe disappear, I decided to call an audible. I was no longer going to go to the break in the fence. It was at the top of the hill, directly in the wind. Instead, I decided to position myself tucked back in the bottom where the wind was pretty much non existent. Even still, it was cold! As I crept around the edge of a frozen over swamp, I was lucky enough to catch a glimpse of a deer coming over the hill in my direction. I stood as still as a statue with my climber on my back and bow in hand. It was clear to see that the doe had no idea I was there. She began to paw at the ground, clearing a space before laying down 60 yards from where I stood. Though she was facing my direction, she was laying up against a tree that offered me some cover to move behind. I looked around for a tree in that direction that I could immediately climb. Once I found one, I slowly moved over to it and climbed the tree as quickly and quietly as I could. I sat in the tree wondering if I’d been quiet enough to not alarm the doe laying down close by. Within 30 minutes I would have my answer as I saw her rise slowly walk back over the hill away from me. Within 10 minutes, I saw several more does walk around that hilltop. I’m guessing it was the same one walking around feeding, but I couldn’t be sure. My hope was quickly fading that the doe would end up walking my direction. If I forgot to mention, it was absolutely freezing out that day. There was a high of 16 with wind chills below 0. To top it off, snow was already coming down even if it was at a slow pace. By 1:35, my feet were frozen blocks of ice. I hadn’t seen the deer one the hill for a few minutes and I was beginning to wonder why I had decided to go out there when it was so cold. I was also thankful that I had been forced in to picking a tree sheltered from the wind. Just about the time my feet became frozen blocks of ice, I caught some movement off to my right. I turned to look in that direction when I saw a mature doe no more than 15 yards from me. She was entering the woods from the edge of the swamp behind me, but still up wind. Following her was another adult doe and a fawn. I quickly rose to my feet as slowly and silently as possible (yes, you read that right). I grabbed my bow and turned back in their direction without a hitch. The problem came about when I noticed that one of my blades had come loose from the o-ring on my rage broadhead. I reached up to fix it and the oldest doe in the group caught my movement. Luckily, I saw her catch me, so I was able to avert eye contact and stand as still as a statue. After what seemed like half an hour, she finally settled down and continued to mill about while still being extremely cautious of me. I managed to re-secure the blade without being caught and again got ready to draw. While attempting to draw back the first time, the arrow began to come back with the string and all of a sudden my release let go. I was apparently not fully locked in with my release. The deer were not spooked by the release coming off. They got spooked because of the sound my broadhead made. This time, both blades came loose from the O-ring that holds them in place. I again re-secured the blades while not getting caught. I did so and was thankful that the deer were still within 15 yards of me. Finally, I was able to draw for the shot. One doe was behind a tree. Another doe was checking on another deer farther up the hill. The final doe fawn was still completely clueless. I settled my 20 yard pin and slowly pulled the release trigger. I saw the broadhead immediately bust open as the arrow left the bow. Even still, the arrow connected with the doe on a double lung shot. As it turned out, I sliced the top of the near lung, and busted straight through the center of the far one. My first public land doe didn’t run more than 60 yards before she piled up. I immediately called wife and brother to let them know the good news. I signed in to the public land at 11:15 am and took my shot at 2 pm. The encounter took a total of about 15 minutes. I saw a total of 8 deer during that hunt. The hunt itself was only about 2 hours as it took me 45 minutes to get ready and walk in. By the time I took the photo you see to the left, it was snowing like crazy and the temperatures were in the single digits. You can see that I have my arms exposed and nothing more than a sweat shirt for warmth. It ended up taking me 2 hours to gut her and drag her out. A vast majority of that time was dragging. This public land doe is one of the biggest bodied deer I’ve ever shot. She was definitely bigger than the 2-3 years buck that my brother shot this year during shotgun season. I’m thrilled that I was able to harvest a deer on my very first public land hunt ever. I’m looking forward to having the week after Christmas off to get back out there for a chance at another public land doe! 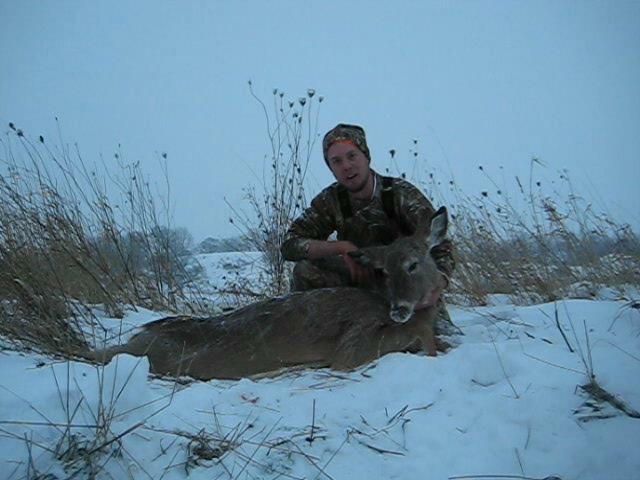 Seeing more deer in 2 hours than some other saw in 3 days of hunting was a huge confidence boost. Add the comment we received from the program manager that our zone has historically been very tough to hunt and you can start to imagine my excitement level. I credit this hunts success to the scouting mission that we did back in September. I knew the terrain well enough to have a very good idea of where the deer would bed. Happy Hunting!